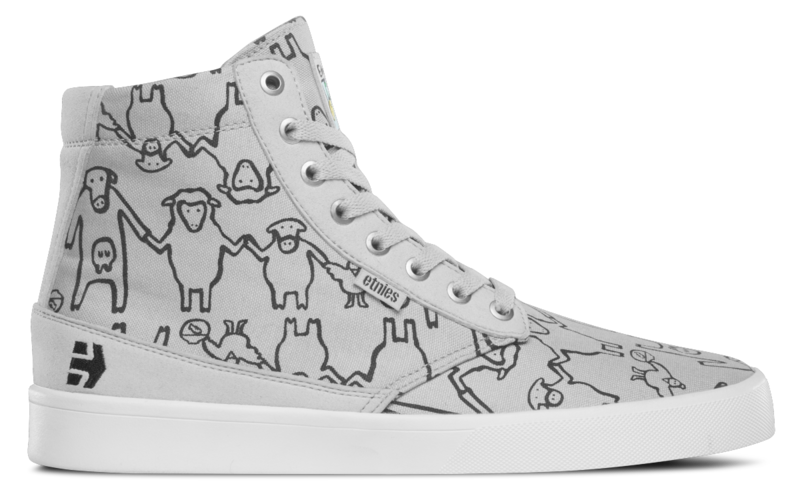 New vegan skate shoe. Mix of canvas, vegan microfibre suede, and hidden rubber toe cap. 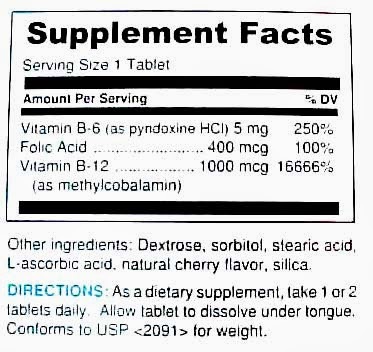 Just what I had "suggested". 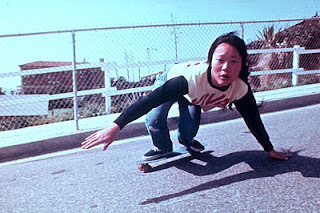 Always good to see vegan skaters. 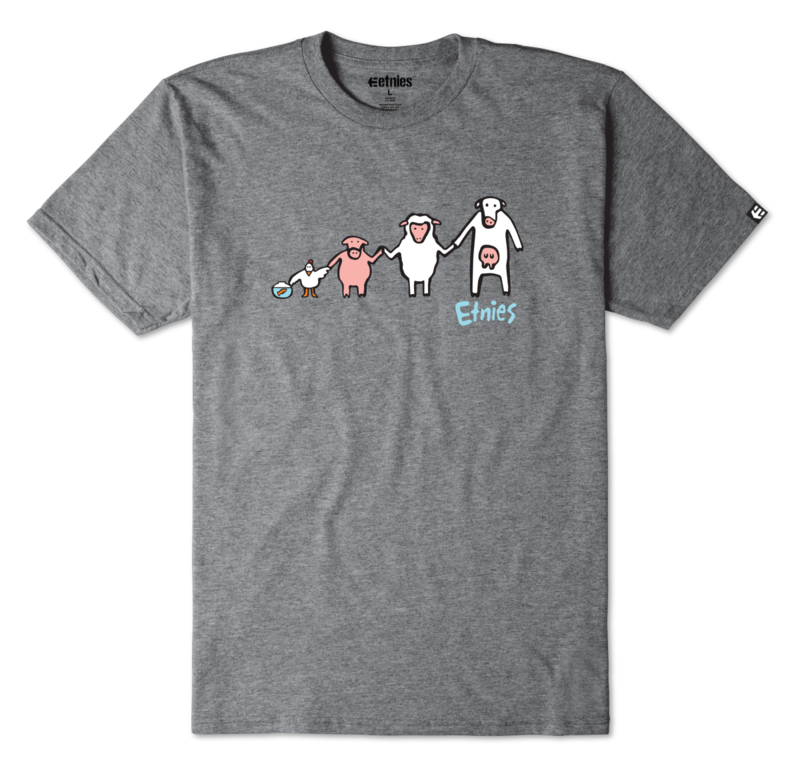 Thank you, Etnies. Remeber when Etnies were only available in skate shops? Good thing times change. 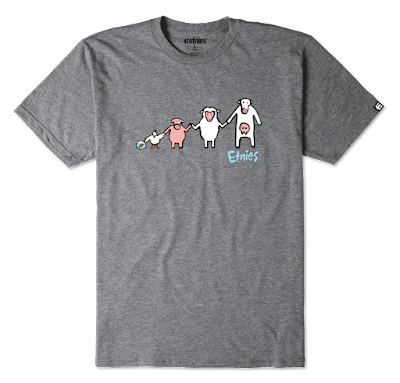 "Gathering inspiration from Ryan Lay’s personal life choice and his performance needs in skateboarding footwear, etnies set out to create a durable, high-performance skate shoe for all vegan skaters." Check out the video. 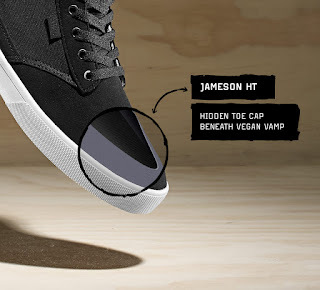 "The Jameson HT is an all VEGAN high top designed for vegan skateboarder, Ryan Lay. 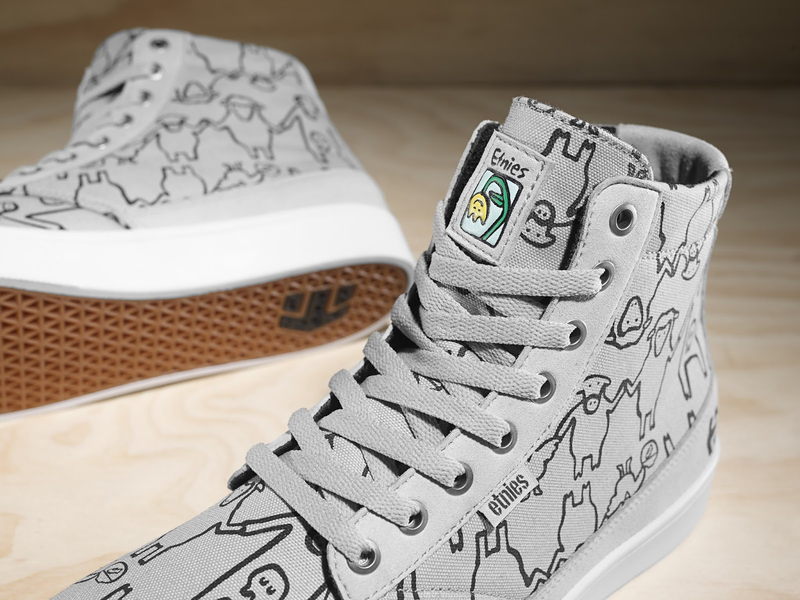 Developed with all animal-friendly materials, it is made with a combination of canvas and a synthetic suede upper for a long-lasting skate shoe. Built by Skateboarding, the Jameson HT features a hidden toe cap for added durability and the team’s favorite Geo-Hex tread pattern for grip. 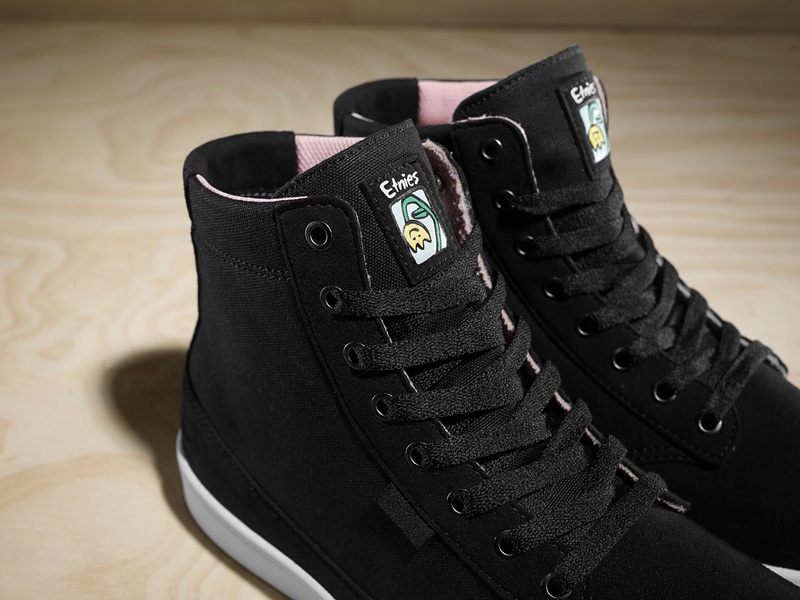 With an egg-crate construction in the midsole, it offers vulc-like board feel in a faux-vulc cupsole." "The Jameson HT features synthetic suede throughout the toe along with a hidden flow molded toe cap underneath for added durability. As one of the few high top cupsoles in the skate market, the shoe’s appeal hits in all the right places; not only does it provide long lasting support and durability, but it also provides peace of mind for those conscious of our environment. 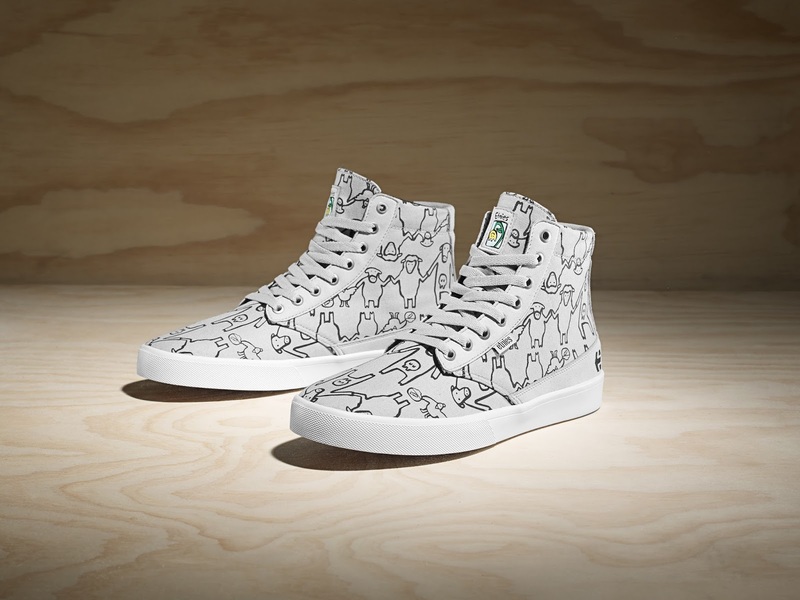 The vegan-friendly model is out now and comes in two initial colorways: a straightforward black/white/gum and a playful grey/black/silver animal pattern designed by Lay’s good friend, Michael Worful of the Skate After School program." Check out this wear test video with Ryan Lay himself. If you want to skate this shoe, you MUST glue the stitching (red rectangle in the picture below). This stitching WILL come loose (= will be completely destroyed) otherwise making the shoe "crack" open. This piece of stitching (on both sides) is the only thing that holds the toe piece and the rest of the shoe together. This is definitely THE weak spot of this shoe. The two strips of microfibre including the eyelets are NOT stitched or in any other way attached to the toe piece. DO SUPERGLUE THIS STITCHING. ... or else ... the stitching will be destroyed and your foot will be exposed to DESTRUCTION. 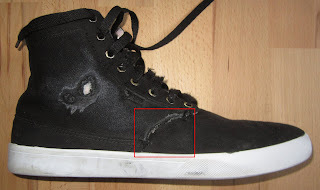 The below-the-ankle textile fabric tear is due to heel flips and not really a problem. Might become a problem though if you're planning on heel flip indulgence. Superglued stitching (after stitching it back together for an hour) pictured below. Again do superglue this stitching BEFORE it ever breaks. You cannot easily penetrate the tough microfibre with a normal needle. So instead you must use the needle holes from the prior stitching. Spare yourself this tailoring experience, and do think of the glue beforehand (= the day before skating these shoes for the first time ... or the second time maybe, if you're forgetful). The microfibre upper is next to indestructible. It MIGHT even be better than the Servant Dagon's "4skin" microfibre suede. It is at least as durable. The hole you can see in the picture below does not go all the way through. Due to differences in griptape (brand new vs. older) I cannot easily compare the Servant Dagon's microfibre and the Etnies Jameson HT Ryan Lay's mircofibre upper regarding their ability to defy destruction by griptape. However, surely this upper is one of the best ever. Another (the only other) weak spot of this shoe is that in my right (front foot) shoe the outer rim of the outsole has come off of the rest of the outsole a little bit in the instep and heel areas. I superglued the instep area of the sole (between the white outer rim and the rubber coloured sole) successfully (surprisingly successfully). And the heel area doesn't really bother me, as the rim doesn't really break off (it hasn't at least). Also, the fact that this is a high-top shoe - I think I haven't worn a high-top skate shoe since the early 90s (?) - doesn't really bother my feet, and unless you're going to wear it with short (prejudice alert) it doesn't look weird, I think. 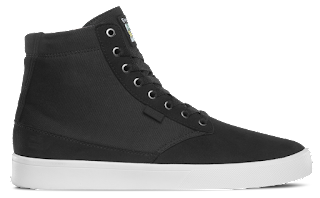 Quite a clean looking skate shoe, that makes your vegan (or slaughterhouse endorsing) feet flick and scoop with satori-like abandon.